It is a known fact that actress turned politician, Jayalalitha will be sworn in as the chief minister of Tamil Nadu for the fifth time. 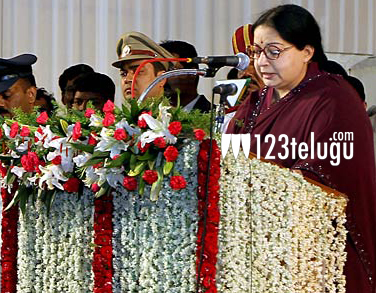 The ceremony was conducted in the Madras University a short while ago and was a star studded affair. Super star Rajnikanth was the main attraction of the event and others stars like Shiva Kumar, Arjun, Karthi, Vikram Prabhu and a whole lot of Tamil stars attended the event. The Chennai city has been decked up and celebrations are on as Jayalalitha is back into power after eight months.